Theseus: Journey to Athens is an independently developed Adventure/RPG game set in Ancient Greece. The story is faithful to the ancient source material, and the art and music is uniquely crafted for the classical theme. 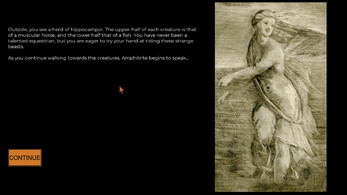 Gameplay consists of exploring the ancient world, speaking with mythological figures, and engaging in turn-based combat. If you are fan of indie titles or old-school gaming, then this is for you. Theseus is an ancient hero who is perhaps most famous for slaying the minotaur. Long before he killed that beast, however, Theseus was just a fatherless boy growing up in the small town of Troezen. His grandfather was King Pittheus, but his mother Aethra was an unmarried lady. As a child, Theseus was told that his father was Poseidon. However, after reaching adulthood, his mother told him a very different story. That is where the game begins: Aethra has just revealed to you that she has a secret message from your true father. Not only is he a foreign king, but he is without an heir and facing a deadly rebellion! The people who would seize power from your father are also eager to kill his possible children. Your life is therefore in danger – you must make your way to your father’s side, or else risk dying at the hands of your father’s enemies. 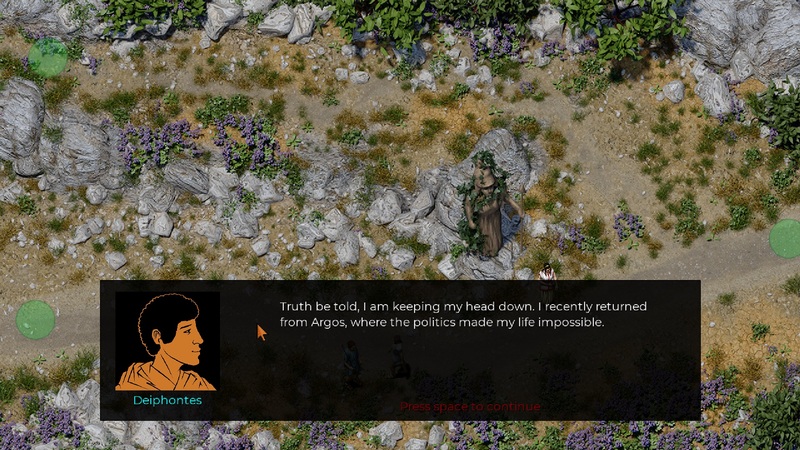 Exploration: At the exploration level, the player travels throughout Greece and interacts with numerous historical and mythological characters. 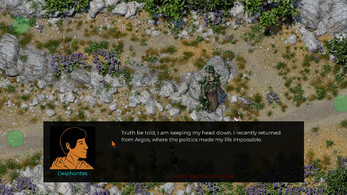 Invariably, the player will get caught up in their troubles and find himself engaged in deadly quests. Choice & Consequence: When the player has become involved in a quest-line, the game switches styles. 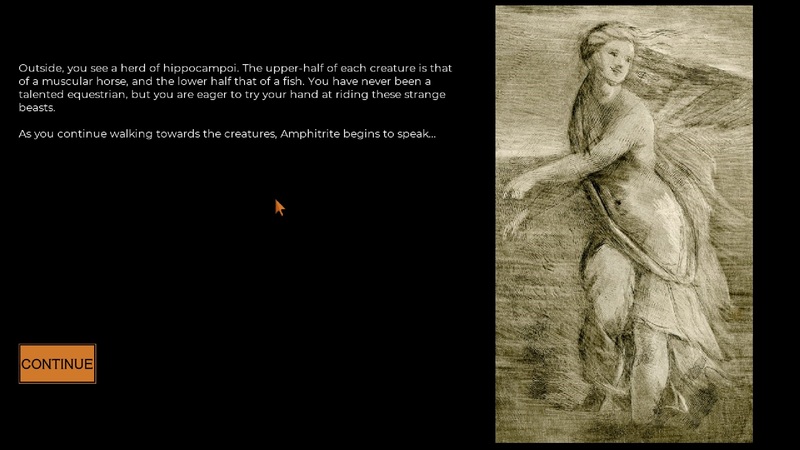 Detailed text and historical sketches are used to explain events to the player, who then decides how to respond. The choices the player makes will radically change the story. These choices have real consequences, and there are multiple different endings. 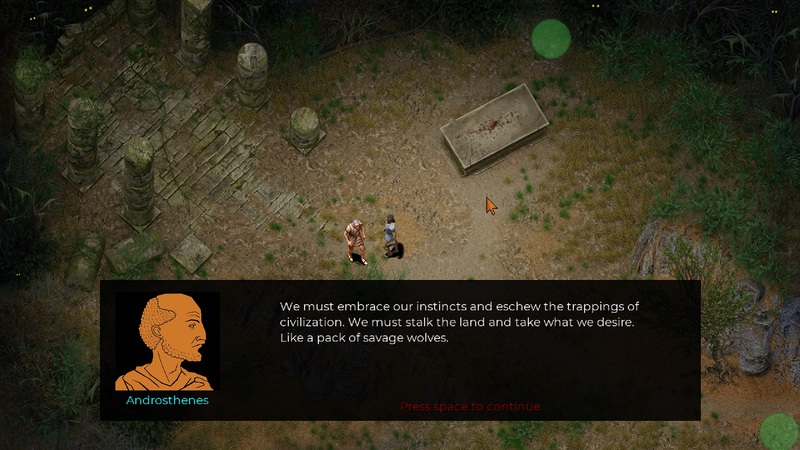 Turn-Based Combat: Ancient people were no stranger to violence, so combat is a very real possibility. The game will switch to a top-down, grid-based combat system, where the player and any allies will face off against a variety of opponents. Items may grant Theseus special abilities, and allies come with their own skills that may help secure victory. Theseus: Journey to Athens combines these three distinct mechanics into one cohesive whole. The player ultimately has the power to define Theseus: is he a violent rogue who attacks anyone who gets in his way, or is he a silver-tongued diplomat who wins everyone over to his side? Perhaps the answer is in the middle – you will have to decide. Lead the ancient hero Theseus as he seeks out his father. The story is heavily rooted in classical texts like Pausanias' Guide to Greece, Plutarch’s Life of Theseus, Apollodorus’ Bibliotheca, and shorter works and fragments such as those of Bacchylides. Over 20 unique locations to explore. 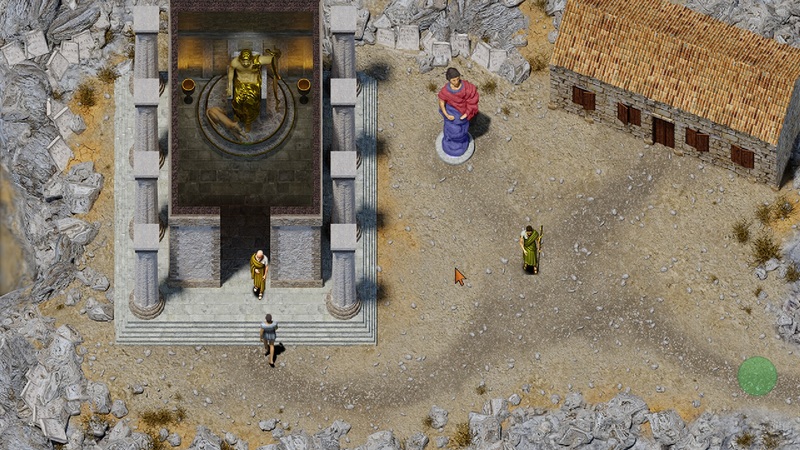 Explore multiple locations in the Peloponnesos, Megarid, and Attica. Each location is populated by a cast of historical and mythological characters. Unique music composed by Michael Landers. The ancient sources tell many different tales about Theseus and his journey to Athens. Now, it is your turn to step into Theseus' sandals. What will you seek to achieve, and how will you conduct yourself as an ancient prince? Free Demo Updated to Latest Version! Theseus - Launched! Release version available. 1. The sound effect when I press escape to get into the menu. It sounds so totally out of place, like a very cheap RPG-Maker-standard-efffect. Could you change that to something more fitting to the setting? For example the sound of a kithara would fit perfectly. 2. Another thing I don't like is the message before leaving a place (where you have to press "y" or "n"). It feels anti-immersive for me to get such a message while exploring a mythic land. Is it necessary gameplaywise? 3. The last thing I pondered on are the green blobs which mark transitions from one scene to another. While they are not terribly obtrusive, they still don't perfectly fit in my opinion. I'd prefer an actual in-world-element to mark transitions - for example a signpost or a stone. I know I'm quite nitpicking with these things. ;) Richard Garriott is responsible for that: My favourite RPG is still the old Ultima VII, because in this game all gameplay elements are actual parts of the gameworld and nothing hinders immersion. Thanks for the suggestions! I think I can get these changes in before the release date (this Thursday, 2/28). 1. Good point, and this is an issue I can quickly resolve. When I get home from work today I will change the sound effect. 2. It's not strictly necessary, no, and the difficulty of the change really depends on several factors. Just to be clear, would you prefer that the game automatically transition from one scene to the other without the prompt appearing and asking for the player to press y/n? I have the menu prompt right now for two reasons, (A) it will stop the player from accidentally leaving a location, and (B) it displays the name of the location. If A is not an issue, then I can try resolving B by having the name of the location appear and then fade away when Theseus arrives somewhere new. For example, if he goes to the Sanctuary of Asklepios for the first time, I could make it display the title "Sanctuary of Asklepios" for a few seconds at the top of the screen. I might just include this in a post-release patch, though; I need to test it and see if it makes for a smoother experience and whether I can make the titles look good and seem unobtrusive. 3. Yes, here's a little secret: those green blobs are one of the few remaining bits of "art" that I made myself. I thought they looked okay so I left them, but I'll try replacing them with something else. If I can't find anything suitable, I'll commission something new and include it in a post-release patch once the artist has time to draw it. I'm pretty confident that I have something appropriate already, though. On a side note, Ultimate 7 is also one of my favourite RPGs of all time. I would like to mention a very similar RPG: Teudogar and the Alliance with Rome. Imagine an improved Ultima 7 engine with turn based combat, and it's set on the marches of the Roman Empire during the time of Augustus. the game is no longer available for download as far as I can tell, but people are still discussing it on sites like rpgcodex.net. 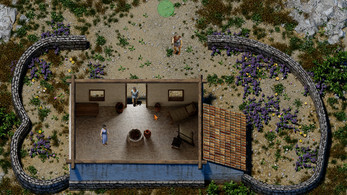 I myself offered to host it on my Steam store if the developer would like; it's a really, really great game for anyone who enjoyed Ultima 7.
for me, an automatic transition would be a good idea, because it enhances the feeling of exploration (and not being held by the hand). If a discrete visual indicator (like the green blob or a substitute) for scene changes is there, I don't think people will accidentally leave a location as they can clearly see where it ends. I find it a very good idea to make the name of the location appear on the screen itself and then slowly fade away. It makes the whole experience much more "dynamic" and authentic without a "press y or n"-window in my opinion. Ah, yep, we've probably bumped into each other the codex. I've been there a long time, my username is Agesilaus. A couple of people on the codex have also weighed in on the transition style; I will test a couple of models and then make it an option. It will need to be part of a patch because it will take a little while. I think you're right, though, it will make things smoother and improve the experience. By the way: Is there a way to contact you per email? Yep, h32c70s@gmail.com, or else just log on to the codex and direct message me. 12/22/18 New Demo released; see Development Log for the release announcement. The old demo has been taken down, the link will give you the new and improved one. Please note, demo has been updated. Save function now implemented properly. I was able to make one save in the game, but subsequent saves result in a fatal error. Thank you for point this out to me! I will get this fixed ASAP and re-upload the demo. For now, I am going to update the message that comes with the demo so that users are aware, and I would advise not using the save function until I upload the new version later today. Essentially, the script I wrote for saving the game was attempting to record an unnecessary variable relating to the turn-based combat. I have tested it a few times on my personal laptop and it seems to be working properly now; I will test it on another laptop right now but I think it's fine.